You are currently browsing the tag archive for the ‘dimensional quilt blocks’ tag. 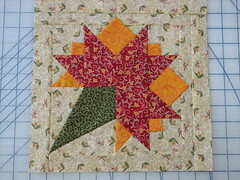 This is number seven of the eight blocks I have made so far for the Around the World Quilting Bee. I had to do a bit of a size adjustment. I had a slightly different plan for this block when I thought it was a 12 inch block. I am sure I broke some quilting rule by adding a border to only two edges instead of all four, but too bad. It doesn’t look very lopsided since the yellow points come out farther. This was the third time I had tried to put the outer border on it, and I had had just about enough. The rest of the block went together very nicely. Even the points that are dimensional. The two big ones and the three small ones are similar to prairie points. You fold a square into quarters and then tuck the raw edges into the seams. It was kind of fun to play with. This one is off in the mail today as well. Perhaps now I can get the kitchen curtains done, and then back to my Storm at Sea project, or some house cleaning – ugh! Thou shalt not steal. That pretty much sums it up. But, in case that isn't clear enough, you are not allowed to use stuff from this site without my permission.